My friend Ashleigh got to ride an elephant, see the Taj Mahal, and participate in an Indian fashion show with the Council for Christian Colleges and Universities’ (CCCU) India Studies Program. My friend Katelyn got to live and study at Oxford, visit Stonehenge, and tool around England as part of the CCCU’s Oxford Summer Programme. For my own part, I got to tour the Pentagon, the White House, and the US Capitol (twice!). I interviewed an ambassador, went to countless museums, and picnicked on the National Mall during my semester in Washington, D.C. at the CCCU’s American Studies Program. Then, during the summer, I was able to do an internship with the US Department of State at the US Embassy in Cotonou, Benin. I got to participate in project inaugurations in remote villages, lead a film program, and even hold some sacred pythons! If you would like to learn more about these experiences and others during my time abroad, visit my blog. While I originally thought I wouldn’t be able to take this unpaid internship in West Africa, I was able to take advantage of this opportunity thanks to a Benjamin A. Gilman International Scholarship. Through my experiences studying off-campus in both the U.S. and West Africa, I learned the importance and benefits of studying abroad. I understand though that some students may have reservations, so I will address some of the most common ones in turn. Studying abroad is too expensive. In addition, there are outside scholarships that can help cover the cost of a study abroad experience. For example, winners of a Gilman Scholarship receive $1,500 to $5,500. Winners of the Boren Scholarship can receive up to $20,000 for programs lasting from eight weeks to a full year. Alpha Lambda Delta also has a national competition for 15 scholarships worth $1,000 each. These are just a few of many scholarships available. My major doesn’t give me time to study abroad. I realize that some majors are highly regimented; students feel they can’t study abroad without falling behind. One way to get around this problem would be to study abroad during the summer. While not all SNU scholarships would apply to this, outside ones like the Gilman and Boren scholarships would. There are also some summer programs that would cover almost all costs. For example, students can spend the summer studying critical languages like Chinese, Arabic, Turkish, Russian, and many more while overseas through the Critical Languages Scholarship Program. There aren’t any programs that would benefit me. CCCU programs offer a wide variety of offerings, from missions in Uganda to film in Los Angeles, music in Nashville to graphic design in Australia. If these offerings aren’t enough though, you can also apply to non-CCCU programs. For example, there are SNU students this semester studying at non-CCCU programs in Austria, France, and Spain. Overall, studying abroad offers many academic benefits, but it is so much more than studying; it’s a chance to fundamentally re-imagine your life. It’s more valuable than you would expect, and, with the fantastic support of the financial aid office and Dr. Dunnington in the Center for Global Engagement, it’s far more possible than you might have thought. Prev PostThe top six (free!) iPhone apps that will make your life easier, cooler, and more fun. 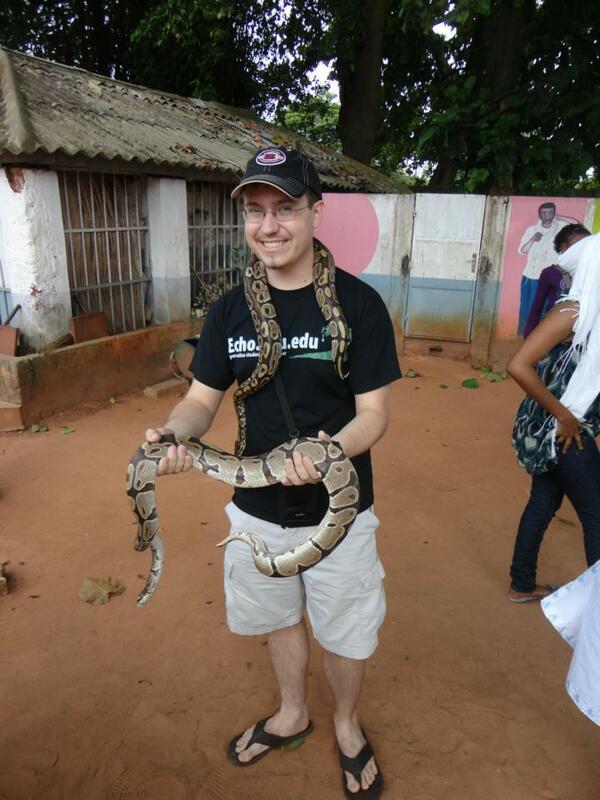 Oh man come on you are holding a living Pythone…..did not you feel scared?